Once asbestos has been identified, an employer has a legal duty to prevent employees from being exposed unnecessarily to asbestos. 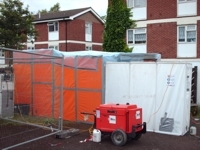 We work in close partnership with just two asbestos removal companies to ensure that our clients have total peace of mind that all works will be carried out following best practices and legally. Many familiar High Street names have engaged our services as we fully understand their need for business to continue as normal. Domestic clients like our attention to detail and determination to keep them fully informed as work progresses.